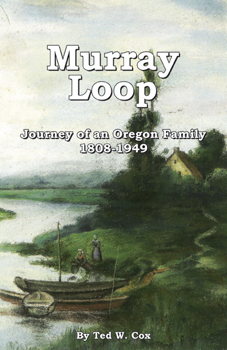 Sitting next to me is the book, Murray Loop, written by Ted W. Cox, which is the “Journey of an Oregon Family 1808-1949”. The book covers in significant detail five generations of the family, their identity as immigrants and Oregonians, and happens to take the Owram side also through the free love community of Berlin Heights, Ohio, to the freethought town of Liberal, Missouri where they met with the Murrays. My Noyes family was also at Berlin Heights and, after an interval in Michigan, went to Liberal, but whether the Noyes and Owrams may have known each other from Berlin Heights I don’t know. I’ve believed that the different communities of the mid 1800s devoted to social reform probably had a fair amount of cross pollination, but there’s slight data on the individuals who traveled through some of them or who may not have been members but were ideologically attracted to live on the periphery of these communities. I first began putting up information on communities such as Alphadelphia and Liberal with the hope descendants of involved families might find their way to my websites (I had a couple of previous incarnations to this one) and that we may began learning a little more of these families, how some of them may have been associated with one another, whether or not they tried more than one progressive community, where they came from and where they went afterward, and I consider Murray Loop a valuable contribution to our knowledge on both Berlin Heights and Liberal. Joseph and Jennie Owram moved to Liberal in 1884, from Berlin Heights. David and Lydia Murray moved to Liberal in 1883 from Nova Scotia. The families weren’t united in marriage, however, until about 20 years later in Oregon. The signatures of Joseph, Jennie and Minnie Alice Owram are on the Spiritual Science Articles of Association petition for incorporation of March 1889. Joseph Owram is also mentioned in a “Liberty” publication out of Boston Massachusetts, July 17 1886, as one who had a falling out with Walser in 1886 on the subject of free love. The Joseph Owram signature on the 1889 petition confuses me a little as the Murray Loop book gives him as dying at the age of 60 in 1886. Does this mean the signatures on the petition predated 1889 and included some from as early as 1886? All I know is that J. P. Moore gives it as dated March 27, 1889 and that it was granted by the Barton county circuit court as of that date. The family of David and Lydia Murray isn’t mentioned in either Harmon’s The Story of Liberal, Missouri, or Moore’s The Strange Town of Liberal, Missouri, nor do I find it in any of the few other documents of Liberal I’ve thus far seen. Many of the families and individuals who went through early Liberal aren’t recorded, however, and it’s nice to broaden knowledge of who was there and perhaps the why of their having been drawn to Liberal, and David Murray is described as having been a “progressive socialist” who read such socialist magazines as “Appeal to Reason” and had a life long interest in social reform. Photos from early Liberal seem rare enough, and the book Murray Loop has some wonderful photos from the family’s stay in Liberal, in particular one of the Murray family home, taken in 1884, and an 1891 photo of children Emma and Hugh Murray in a group of people standing before “Harmony Hall”. There is also a photo of Minnie Owram at a Christian Science Class in Liberal in May 2, 1891. Cox mentions he has found no record of Harmony Hall and writes a little instead of the history of Mental Liberty Hall. I do know it isn’t Spook Hall (the Spiritualist house). The picture of Harmony Hall also doesn’t match up with the couple of photos of Universal Mental Liberty Hall. Is Harmony Hall a meeting place perhaps that hasn’t formerly made it into one of the histories on Liberal? Minnie Owram was a photographer–as a teenager she took the photo of the Murray family home–and the book describes at some length her progressive attire, her shortened hair and skirt, her comfortable shoes and lack of a corset. At the time her style of dress is said to have earned her the label of “hussy” and an interview and photo in a newspaper–which newspaper, I would love to know. Her decision not to wear constraining shoes and corset sound very much like the style of my great great grandmother Caroline Atwell Noyes who also believed in dressing for health rather than fashion. The 1880 census in Berlin Heights, Erie, Ohio shows Joseph Ouram 48, Jennie P. Ouram 55, Minnie A. Ouram 11 and Mary Crawford 65. We don’t have the benefit of the 1890 census as it was destroyed in a fire. The 1900 census shows Lydia and Hugh still in Barton County, in Ozark, District 25. Lydia is given as the head, married, age 64, born in Canada. Hugh, born June 1867 in Canada, is with her, age 32. Minnie and her mother Jennie were by now in Toledo, Lincoln County, Oregon, Minnie A. given as 31 and single, born in Ohio in Oct 1868, her mother Jennie given as 75 and widowed with 3 of 4 children surviving, born Oct 1824 in New York. The 1910 census for Toledo, Lincoln, Oregon shows 42 year old Hugh married 5 years to M. Alice, who was 41. They have 3 children, David J. who is 3, Alice F. who is 2, Lucy who is 1 month. Hugh’s father David, now 72, is also with them. A review of the book by Pat Wilkins states, “Another key historical element pertaining to the region in which the Murrays finally settle for good is reported in a crystal clear description; that of the conflict between the Territorial Act of 1848 which acknowledged Indian possession of land, an the Donation Land Act of 1850 which opened the land to settlement by whites.” Indeed, I was interested to see this aspect explored by Cox, a lifelong resident of Oregon, as relations of my McKenney side of the family migrated out to that same area in Oregon in the 1880s, Charity Alice McKenney keeping a travel journey of that move, and her daughter, Nona Strake, wrote on her early childhood in Oregon. In her bio, Nona had a great deal to remark upon the displacement of Indians in Oregon, the treatment of them by whites, and her perceptions of how the environment had suffered greatly due to white immigrants having a considerably different relationship to the land than the indigenous inhabitants. As was its intent, the book is an excursion in history, far transcending a simple genealogy or a collection of family reminiscences and hopefully will find its place in the homes and libraries of those who take an interest not only in the history of Oregon but of also the nineteenth century progressive communities of Berlin Heights, Ohio and Liberal, Missouri. Here, at the book release party of Murray Loop, Ted Cox gives a talk on oral tradition in indigenous culture. And here he tells the story of Rabbit and Coyote. Ted Cox, the author of “Murray Loop”, emailed me saying he has recently revised his conclusion as to when Joseph Ouram/Owram passed away. You should contact him regarding both the petition from 1889 and his revised theory (based on family letters) to see if a better date can be derived. Joseph Owram is also mentioned in a book about the “Modern Times” community on Long Island in the early 1860’s. It seems Jennie Crawford (Owram) moved to Berlin Heights with her sister Mary prior to the arrival of Joseph. While living in Berlin Heights Jennie was published in a feminist journal of the day under the pseudonym “Jennie in Bonds” referring the the bonds of her first marriage in an era when divorce was illegal. I have recently found (a few) additional photos Minnie took while living in Liberal (in my mother’s collection). When I get around to scanning them I’d love to post them to your site to see if you can identify any of the people in the photos. Minnie also wrote memorable poetry while she was growing up in Liberal – poetry that gives insight both to her thinking and to the culture she was part of. Thanks, D’lorah, I’ll have to write him. Would love to get the photos from you when you’ve the time. Will be very pleased to have and to post them. If you would be willing to send along some of her poetry, that would be interesting to post as well–as you say, lending insight to the culture of which she was a part. This is the book that mentions Joseph Owram…While I don’t have a copy yet, I’ve read excerpts on line. An article in Volume 1, Number 2/ August 1979 issue of the Library of Congress “National Preservation Report” by Wiiliam F. Vartorella: “Victorian Era Communitarian Press Preserved”. Though brief, the article is rich with references. The ISSN# is: ISSN 0190-9819. I wish I could embed the .pdf, but that is not working for me right now. Noyes is mentioned, as is “Jennie in Bonds”. Per my understanding, Mr. Vartorella’s family is from Berlin Heights and was associated with the Free Thought movement there. Thanks, D’lorah. I was able to find the Vartorella report online. The Noyes mentioned is John Humphrey Noyes. He’s a distant relation of my James Noyes. James Noyes grew up in a Fourier commune in Michigan that his father had helped start. After that broke up he traveled to different communes and my understanding is he did go to Oneida as well but I don’t know when. Are you lucky enough to have a copy of the book mentioned, “Berlin Heights” Free Love and the New Faith in Ohio, 1857-1871″? Sorry for the delay in my reply. No, I’m not lucky enough to have a copy of the book, and I haven’t been lucky enough to find it in the University of California library system, said to be the largest library in the world….Several years ago I tracked down the author and wrote to him. I heard back once and things sounded promising. I sent him a copy of “Murray Loop” and haven’t heard back from him since. I recently found some of his relatives on the Berlin Heights Historic Society Facebook pages. Oh, just as an aside, I DID find one copy of the book for sale – worldwide. It was for sale by an online bookseller in London, England for $1,472.07. It seems as if the University of Southern Indiana might have William Vartorella’s PhD thesis covering much of the same material, I would guess. Also, it seems Ohio University might have some archival materials. The search continues….